•Rotor diameter: 200mm (8″) four propellers provided. •Dimensions with the indoor hull: 525 x 515mm (21 x 20.5”). •Dimensions with the outdoor hull: 450 x 290mm (18 x 11.5”). •Integrated Flight battery: 3 cells 11.1v 30w 1,000mAh 14g lithium polymer pack. •Charging time: 60-90 minutes for a full charge. •Flight duration: Up to 12 minutes between charges. •Materials: The AR.Drone features a robust carbon fibre framework and lightweight expanded polypropylene foam protective body for indoor use. A streamlined hull is provided for flying outside, for reduced wind resistance and maximum speed. •Lighting: A pair of red and green LED lights are conveniently fitted front and back for illumination, added effect, and to assist orientation particularly in poor light. •Motors: 4 x 15w brushless electric motors, capable of 28,000 rpm when hovering. •Control specification: AR.Drone supplied completely ready to fly, after downloading a free copy of AR.FreeFlight from the App Store®, and charging the LiPo battery. •Radio: Wi-Fi module located in the cockpit generates its own connection, with a range of up to 50 metres. •Autopilot: Provides automatic take off, hovering 80cm above the ground, or any pre-determined height, and immediate immobilisation upon release of controls. •Auto landing: Both upon command, or when flight battery exhausted, following warning. •Horizontal front camera: 93 degree wide angle lens, recording 30 frames per second at 720 pixels resolution for live streaming to iPhone®, iPod touch® or iPad™. Camera additionally facilitates other drone detection, validation of shots fired at enemy drones and estimate of distance up to 5 metres range, whilst three dimensional tag detection confirms the accurate position of virtual objects on screen. •Vertical camera: 64 degree diagonal lens, high speed format recording 60 frames a second, for superb horizontal stabilisation at 176 x 144 pixels resolution, combined with the AR.Drone’s patented anti-vibration system. •Safety features: Automatic locking of high efficiency propellers in the event of contact. Low battery warning appears on touch screen display, followed by automatic descent. •Autopilot: Takes over immediately, upon release of controls. If you receive a telephone call while flying the AR.Drone, the autopilot will stabilise it, and subsequently land. •Software: Download a free copy of AR.FreeFlight from the App Store®, available in two versions suitable for beginners and experts. AR.FlyingAce and AR.Pursuit can be downloaded from the App Store® for a small fee, to facilitate augmented reality games. •Operation: Fly indoors in a reasonable size room, or outside in calm conditions. Simply tilt the iPhone® or similar to make the model travel forwards, backwards and sideways, left or right. Slide the virtual throttle forward to climb and hold in a hover. Diagonal movements will make the AR.Drone spin in either direction, press land to safely descend. •Instruction manual: A quick start guide provides helpful hints and tips for the new or experienced pilot, with even more detailed information available online. Age recommendation: 14+ Adult supervision advised for safe operation. •Colours: Parrot AR Drone 2 Quadricopter comes in three colours – Orange and Green, Orange and Yellow, Orange and Blue. Please choose colour from above options. Remote control helictopers, aeroplanes and cars move over and make way for the The Parrot AR.Drone 2! As seen on Channel 5’s The Gadget Show, CITV’s Cool Stuff Collective and the BBC’s Top Gear, this is the world’s first Quadricopter and represents an unprecedented phenomenon as the ultimate flying toy! Easily controlled by Wi-Fi using a smartphone or tablet, the Parrot features a high definition camera with a video recording facility, plus flight data sharing, a patented piloting mode, and an innovative pressure sensor for increased stability at any altitude. 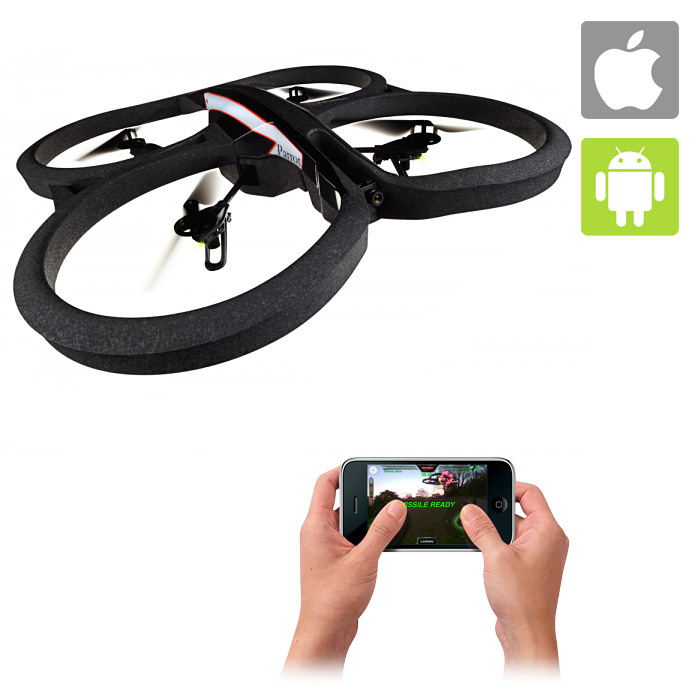 Parrot’s outstanding AR.Drone 2.0 offers just about every possible option on the enthusiast’s wish list, and can even perform 360 degree flips on command! The horizontal forward facing camera transmits real time video, showing exactly what the quadricopter sees on the smartphone’s screen. It has a 720 pixels HD resolution, streaming 30 frames per second, so you can record what the average bird or your Parrot Quadricopter sees. For gaming purposes, this camera can also recognise specific shapes and colours to show augmented reality elements on the screen. Now you can record and share your flying experiences with others, thanks to the new AR.FreeFlight 2.0 piloting application. Additionally with the Travelling Feature, the pilot can film HD video sequences like a professional. Simply select the direction of travel, plus the duration, and the AR.Drone 2.0 does the rest automatically. Absolute Control introduces an extremely useful ultra intuitive flight mode. After the AR.FreeFlight 2.0 pilot application has been downloaded onto an iOS™ or Android™ smartphone or tablet, the Parrot AR.Drone 2.0 connects to the device via Wi-Fi. After connection, all the onboard instruments appear on screen with a cockpit view. Press the take off button briefly and the four powerful brushless motors turn on, the AR.Drone 2.0 will take off by autopilot and hover about one metre above the ground. Flying is very simple, with your thumbs placed on either side of the screen, a control button automatically appears beneath. Press and hold the left button and the AR.Drone 2.0 follows the movement of the pilot’s device. It moves forward, backwards or sideways when you tilt the tablet in the appropriate direction. Slide your finger vertically or horizontally over the right button, and the quadricopter rises, descends or slowly rotates left or right. Thanks to Parrot’s patented new Absolute Control mode, the player accesses an even more intuitive piloting system. With a 3D magnetometer, the AR.Drone 2.0 knows its precise position with respect to the smartphone, which becomes the reference point. The pilot no longer needs to worry about the orientation of the AR.Drone 2.0. Experienced players may still select Relative Flight Mode, to switch back to conventional control. This disables the magnetometer, and the pilot can manage the quadricopter’s orientation without assistance. Surprisingly stable at any altitude, the AR.Drone 2.0 contains several micro electromechanical systems, a 3-axis accelerometer, a 3-axis gyroscope, a 3-axis magnetometer and a pressure sensor to correct the alignment automatically. The quadricopter generates its own Wi-Fi connection, with a range of up to fifty metres. It will fly continuously for twelve minutes with the 1,000 mAh rechargeable lithium polymer battery provided, whilst recharging from the mains in an hour and a half. Four high performance propellers, specially designed for the AR.Drone 2.0, make exceptionally smooth flights possible. A second vertical camera placed beneath the quadricopter, can be selected to show live video on screen, and additionally measures the craft’s speed using an image comparison system. Suitable for beginners and experts, the AR.Drone 2.0 features a tough carbon fibre central cross. It is supplied with two distinctly different hulls, made of flexible expanded polypropylene foam. They are both highly resistant to impact, and protect the more delicate internal parts. For outdoor flight, the lightweight streamlined hull reduces wind resistance and preserves the quadricopter’s excellent handling and stability, even in a light breeze. When operating the AR.Drone 2.0 with the indoor hull, the four foam rings protect the blades, and your furniture from impact. As a safety feature, the rotors are designed to stop immediately upon contact. Two pairs of red and green lights are positioned on the landing gear to assist orientation.